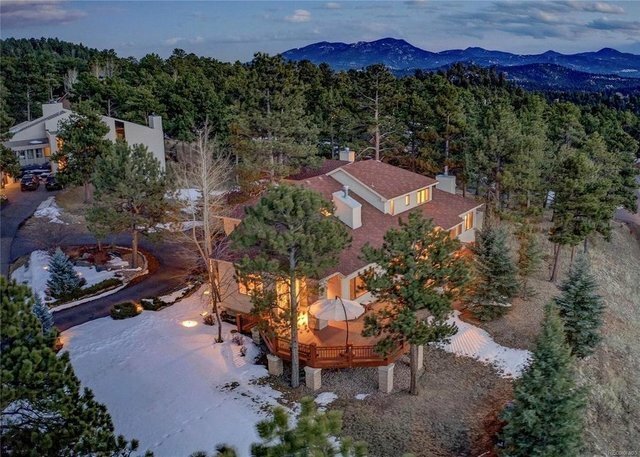 Spectacular home w/main fl living in "The Ridge at Hiwan",easy access to I-70 for downtown commute or the Mountains for a day of recreation, near amenities and miles of hiking and biking trails in adjacent open space. Enter this home to be greeted by cathedral ceilings, handsome iron railing staircase, and beautiful hardwood floors. Spacious office w/ deck access and ample built-in shelving. Formal LR and DR are divided by a 2 sided fireplace and walls of windows. Remodeled kitchen will impress with custom Alder cabinetry, 6 burner Wolf gas cooktop, SS double oven, built-in Miele coffee station, Sub Zero Frig and handsome granite-open to FR w/vaulted ceilings, gas FP & sliding doors that lead to a fabulous deck providing Panoramic views of Mountains & Hiwan Golf Course. Main fl master ste. w/FP, sitting nook, and luxurious bath .Upper has 2 lg bedrooms each with w/in closet & updated F bath. LL walk-out has a grand rec rm + 2 bedrooms and Lg. full bath+ @700 SF of storage.